Our previous spotlights have focused on stories of Pindify Providers who have solo projects they are publishing on Pindify. This spotlight focuses on an artistic agency founded by Malin - founder of Mave Music. Mave Music is an artistic agency where Malin collaborates with PR representatives and managers of bands and other creatives and entertainers. Malin sees Pindify as the perfect complement to the most popular digital platforms, “I think Pindify is more interesting than other platforms as it has the capabilities all the other digital platforms have, e.g. video, image, text, audio - just a wider range of uploading capabilities. You can blog, post pictures, songs - all in one platform.” Not to mention, you can easily monetize all your premium content - which most digital platforms cannot boast. Who is Malin? How does Malin Pindify, and what does she see are future opportunities for Pindify Providers? Malin is from Stockholm and has worked in the music industry for almost her entire career. She started playing music early after her first tour as a choir-girl when she was twelve years old. Then she went on to study music in high school and made big plans to succeed at a career in music performance and composition. She also had a dream to become an actor and attended Calle Flygare's theater school - a drama school in Stockholm. She oscillated between music and acting - but she knew she loved being on stage - that’s where she felt she belonged. Like many creatives, Malin gained maturity. With that maturity and exposure to the stresses of being the center of attention, she decided that being behind stage, supporting other aspiring artists and creatives was a much better fit for her personality. She always knew that she could relate to an artists’ dream of standing on stage - lips quivering, and knees knocking, and she wanted to help them reach their dreams. That's how Malin began her journey. Malin also worked for the television industry for a few years as a producer in various media and entertainment firms. One of her most creative jobs she loved was working for a children’s television program. Here she had the autonomy and freedom to drum up her own creative ideas and see them to fruition. While working in TV, music once again began calling for Malin and she wanted to discover more ways to integrate her love for music into her career in media. She then began working for booking agencies and record companies which led her to where she ended up - in PR and talent management, running her own agency. Malin has worked with many artists and bands in the genre rock but she has also worked a lot with the pop genre. "(Running an agency is) quite mixed and I like having that variety in my profession. 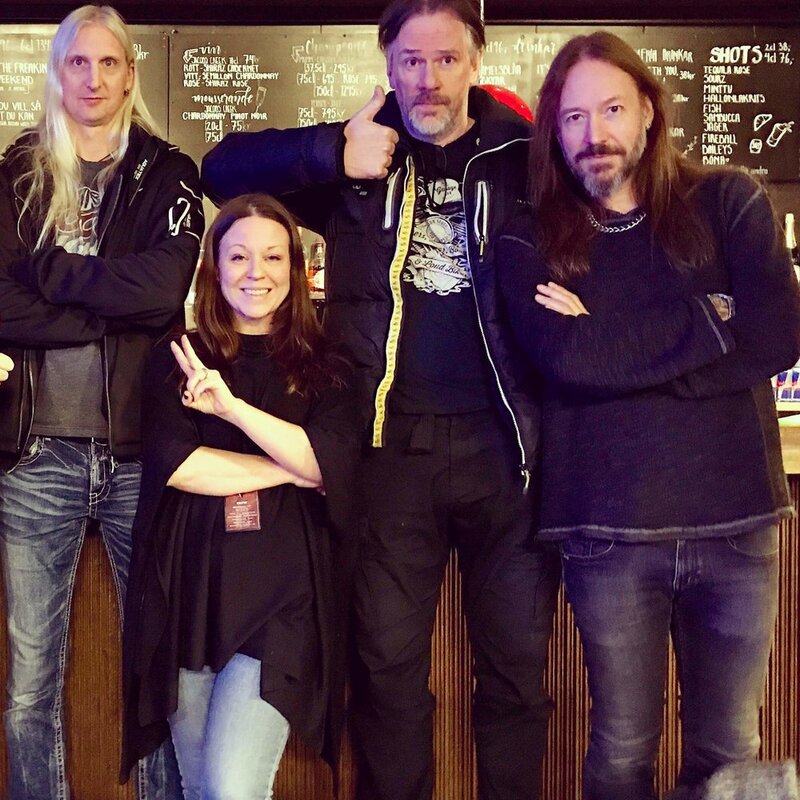 My week consists of working with everything from artists from the song competition Idol to rock bands like the Swedish Backyard Babies." Malin knows how to juggle with the best of them. She says she often has eight or more ongoing projects with a number of artists or bands all at the same time - but she loves the work and the challenge. Some projects she works on PR, and other projects demand the attention of management. Malin has a penchant for finding new artists and she gets the biggest kick out of helping artists who are on their way up. And she enjoys the maturity of older more established artists - just a different type of work. As the music industry is in constant motion, it is important to keep up with everything inside the industry. Malin talks about what happened inside the music industry when streaming services interrupted business as usual. During the advent of the rise of the streaming services, she saw the industry crash and artists began to really struggle to make money from their record sales, if they could even break even. Figuring out ingenious ways to earn money as a musician helped a few artists, but mostly this had a huge negative impact on artists and Malin saw first hand the disappointment artists faced when their dreams weren’t realized. "I think one of the biggest misconceptions is that many people think musicians live a glamorous life and earn a lot of money. Just because you have gained a lot of exposure on a major streaming service does not mean that you are making a lot of money." Malin explains that people do not understand how tough it is to be a musician and artist today, and that’s a big problem. If there are going to be changes here, Malin says, “people must understand first that artists must be mentally strong in order to be able to follow their creative endeavors. Established bands and artists must continue to develop their skills and, above all, keep up with industry developments in order to remain relevant and interesting. Sometimes artists can feel like they’re falling and failing, which is when I swoop in and act as support.” Malin thinks that to be a good manager, you must always be there for the artist, even when winds blow hard. A manager is the person who is the artist's first point of contact to the outside world and has a bird’s eye view of the artist's career. You should have control over all strategy, finances, but also be there to support. Pindify lets an artist have closer and more direct contact with their fans, and Malin says she thinks Pindify acts like a traditional - but exclusive fan club. Malin focuses on her artists working and publishing their content on Pindify. For example, Swedish singer Lisa Ajax has just published her portfolio - go check it out here! What Malin likes the most with Pindify is that artists get paid for all the content publish and when they invite their fans to the platform. For example, as a video-blogger. The videos are incredibly time-consuming to make and costs an enormous amount of money to produce. So an artist should get paid for the consumption their music video. Other platforms do not support this business model. Pindify exists so that artists can be heard. And get paid. We at Pindify have created the perfect complementary platform and all the publishing tools artists could possibly need to pursue their passions. Want to be heard? Want to get paid? Then get started! The future of digital media. Let’s not stiff the artists we love!